***Swimming pool and hot tub closed April 28 through May 4*** TheHoliday Inn Express Hotel & Suites Beatrice is located 40 miles south of Lincoln on hwy 77. Beatrice is home of the Homestead National Monument, Homestead Days, Beatrice Speedway, Beatrice Country Club, Big Blue Water Park, Community Players Theatre and many other area attractions. Beatrice Industrial Park is close by which includes, Exmark, Husqvarna, Blue Valley Automation, Beatrice Biodiesel, Encore and NEAPCO. A short drive north on Hwy 77 will get you to Lincoln for SouthPointe Pavilion shopping, Memorial Stadium, University of Nebraska, Lincoln Children's Museum just to name a few. 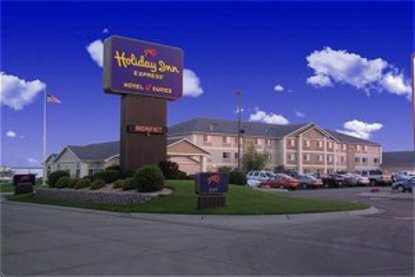 The Holiday Inn Express Hotel & Suites of Beatrice is designed with the Stay Smart traveler in mind offering travelers a comfortable and affordable stay. Our suites feature a separate bedroom with king sized bed and some include a whirlpool bath.Relax in our refreshing heated Indoor Pool and soothing Jacuzzi, and a well-equipped fitness center. Start your morning in the Great Room with a complimentary newspaper and delicious Smart Start breakfast bar while relaxing by the fire. Monday thru Wednesday join us for our complimentary Managers Reception from 5:00 PM - 7:00 PM with complimentary drinks and hors d'ouerves.Join us in Beatrice and stay in style. This hotel is committed to providing accessible facilities under the American Disabilities Act. If your accessibility needs are not met, please contact the Hotel Manager on Duty. Should you require additional information regarding accessible facilities for guests with disabilities, please call 1-800-Holiday (U.S. and Canada) or contact the hotel directly. For the hearing impaired, TDD service is available at 1-800-238-5544 within the U.S. and Canada.